What do you get when you mix together mystery, suspense, psychological thriller and sometimes even a little romance? 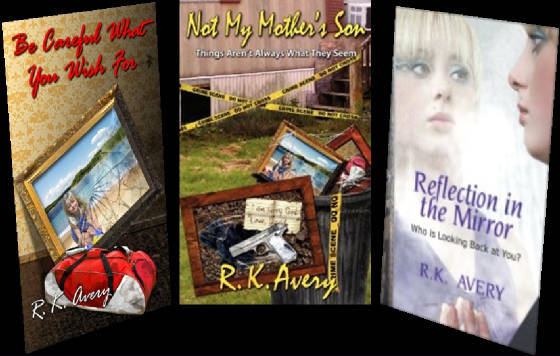 The writing style of R. K. Avery, best selling author! Welcome to my web site. I hope to keep this updated so you can see what's going on in my world. It may encourage you to follow your dream and write a book, or it may deter you from ever picking up a pen. Regardless, this is my journey and what makes me happy. Good news! Be Careful What You Wish For was nominated for the Choose to Read Ohio 2013 - 2014 booklist! Unfortunately it was not picked as one of the top 20 but still, to be nominated is a tremendous honor. Tell everyone you know. Word of mouth is so very important. If you read any of my books, don't forget to post a review. You would not believe how people read these reviews and base whether or not to read the book based on what others think or say. The old adage, no publicity is bad publicity still holds true. Buy a copy of a book for a friend, co-worker, relative, or a total stranger. You may never know what they are going through and what might help them along their journey. Start a book club or join a book club. A book club is a wonderful way to share the love of literature with like minded people. Check back here often to see if I am making an appearance in your area.